I think if you've read one of these books, you've read them all. Same old, same old. Interesting enough story but nothing earth shattering. I will mention, however, that Marilyn Ross certainly knows how to create that gothic atmosphere. The descriptions are perfect.While these are interesting enough, I've decided that I really want to read more stories about the original DS citizens - some stories between the TV stories - not adventures about these newly introduced characters (and Barnabas). And that is what these books are about. I guess there are only so many places the author can take the original characters, though, hence the the new blood.But, these will stay on my keeper shelf as they are slowly becoming harder and harder to come by, good story or not. This Dark Shadows book is #12 in a series of 32. By this time, author Dan ("Marilyn") Ross has established his own tried-and-true formula. All of the stories follow pretty much the same pattern:(1) The heroine arrives at, or already resides at, Collinwood. (2) The heroine meets Barnabas, either prior to or just after her arrival at the great house. Not realizing that he's a vampire, she falls in love with him. (3) The heroine finds her life endangered by some natural or supernatural threat. (4) Barnabas saves the day. (5) The heroine realizes that he's a vampire but still wants him anyway. But Barnabas deserts her rather than enmesh her in his own cursed existence. The heroine is sad. THE PERIL OF BARNABAS COLLINS follows this formula exactly. Diana Hastings is the heroine, a perky English girl of the Victorian period. She meets Barnabas in London and predictably, falls in love with him. Her disapproving mother, however, whisks her off to Italy to marry an Italian count. The Count of Baraga turns out to be a grotesque horror and totally mad. He murders Diana's mother and tries to molest Diana! Barnabas arrives in the nick of time to rescue her. He then brings her overseas to Collinwood, where the sinister Dr.Padrel is at work (supposedly) on a cure for Barnabas's vampirism. But Padrel seems more interested in playing Dr. Frankenstein to his own dying daughter, with rather gruesome results...A good read. In many ways it reminds me more of a Hammer film than the Dark Shadows TV show. And I mean that as a compliment, since the Hammer movies were always great fun. I especially like Ross's framing device in this novel. In the opening chapter, we are in the present day with Maggie Evans, who finds and reads Diana's now-antique diaries. The book ends next morning with a sleepy-eyed Maggie vaguely remembering that she had "bad dreams" about the long-dead Diana Hastings the night before. Not much wonder! Maggie and Caroline are doing some cleaning and find an old diary. The story in the diary is from about 80 years earlier and concerns Barnabas finding a young woman named Diana and how a love relationship developed between the two of themThat part takes up the first part of the book, maybe 1/3 of it. Then the rest of the book deals with a nutso count and a nutso 'doctor' who chase after Diana and claim to have a cure for Barnabas, in that order.In effect, it's almost like this was supposed to be two separate books but neither was long enough so the author basically stuck them together with the nutso 'doctor' as the glue.There is no doubt at all that Barnabas and Diana are in love, and that she accepts him as he is. The ending of that affair, of course, is quite predictable. The crazy 'doctor' is somewhat like another character in an earlier book, claiming to want to help Barnabas but really pursuing his own wants.Why do I call him nutso? He acts like Frankenstein. Read the book and find out how! Oh dear oh dear. I know these were written quickly, but didn't Dan Ross (he wrote these under his wife's name) have an editor, or at least a thesaurus? Example: page 52--"She allowed the powerful Barnabas to lead her out of the room." And just one page later: "Barnabas grabbed him with his powerful hands" and "the Count was no match for the powerful Barnabas." Hmm. I'm thinking Ross is trying to convey that Barnabas (and his hands) are powerful. I could be wrong.And you do start to wish that the exclamation point on Ross' typewriter would break.These things aside, the story, while too rushed and lacking in some detail, is enjoyable if you don't give it much thought. A nice time-waster. It got better by the end, but still not exactly what you would call great literature. Spent more time telling than showing. The formula in this series is wearing thin... which is a shame, as the show itself was fantastic. 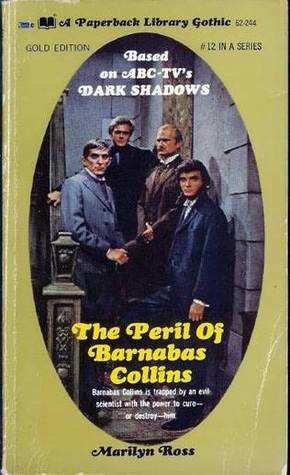 But the books insist on not using characters from the show except in the framing elements... and Barnabas, of course.